Winter was cold and wet. Spring was rainy and with low temperature so the vines growth was slowed down. From June on we enjoyed a warm and breezy summer, enabling good and healty plant development throughout the vineyard. Veraison happenend later than usual and as to the plots dedicated to Monteti we had to wait until the 12th of September to start harvesting the Cabernet Franc. The weather was ideal for the entire harvest that ended the 3rd of October with the Cabernet Sauvignon. The selected grapes were very healthy and ripe to perfection. Deep ruby red, offers a wide range of aromas: dark fruit, spices, cocoa, cassis, leather, Mediterranean woodland with balsamic and floral hints. 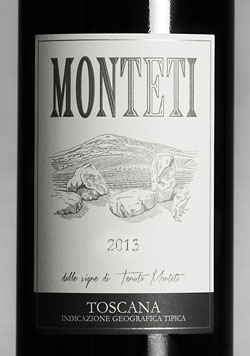 In the mouth is enveloping, long and elegant, sustained by a good acidity and a fine tannins structure. MATURING: 20 months in medium-toasted French oak barriques (70% new and 30% of second passage). This is followed by further 24 months of bottle ageing. No fining or filtering.